Etymology: its french name "chalef" is the name in Arabic of the "willow" to which they thought that Elaeagnus was related. "Elaia" means olive tree in Greek. Origin: Europe. There is an American species (Elaeagnus commutata) which blossoms in spring and a Japanese species (E. pungens), with persistent foliage. Deciduous foliage, in general. Leaves with silver lower face. Flowers in June, tubular, odorous. To some species, flowers appear in autumn. Fruits: drupes 2-3 mm in diameter. 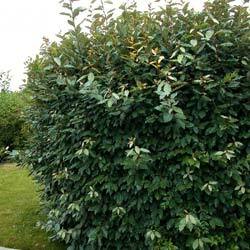 Use: hedge shrub. Its roots contain nitrogen-fixing bacteria. Shining and tough leaves, dark green on the top, silvery on the underside. Blossoming of small flowers whitish and fragrant at the beginning of autumn. It is a nice shrub ideal in pruned hedge.